The Making Dialysis Safer for Patients Coalition is a partnership of organizations and individual stakeholders that share the common goal to prevent bloodstream infections among patients receiving hemodialysis. Led by the Centers for Disease Control and Prevention (CDC), in collaboration with the CDC Foundation, this public-private partnership strives to improve adherence to evidence-based recommendations, share information and experiences, and engage patients in infection prevention efforts. More than 425,000 patients receive hemodialysis for ESRD in the United States (1). Infections are an important cause of hospitalization and death in this population. According to the US Renal Data System, patients receiving hemodialysis spent approximately 3.5 days per patient-year hospitalized for infection, compared with 2.1 days for cardiovascular hospitalizations (1). And whereas the adjusted rate of hospitalizations for cardiovascular causes among patients receiving hemodialysis has fallen since 2005, the hospitalization rate for infection has remained relatively stable. In 2014, these two cause-specific hospitalization rates were roughly equal (0.45 admissions per patient-year). Each year, patients receiving hemodialysis experience approximately 29,000 bloodstream infections (BSIs) with onset in the community (versus hospital-onset); three fourths of these are considered to be related to the hemodialysis vascular access (2). Seventy percent of vascular access–related BSIs occur in patients with a central venous catheter (CVC). Variability in access-related BSI rates across dialysis facilities has been documented, particularly among the subset of patients with CVC (2,3). This, together with successes of hospital-centered programs to reduce central line–associated bloodstream infections (CLABSIs) in intensive care unit and other inpatient populations (4,5), has highlighted the potential opportunity to prevent a substantial number of BSIs, and resultant morbidity and mortality, in hemodialysis patients. In late 2016, the Centers for Disease Control and Prevention (CDC) and the CDC Foundation launched the Making Dialysis Safer for Patients Coalition (6). The Coalition is a partnership among a broad range of healthcare, public health, and patient safety organizations, and individual stakeholders. The mission of the Coalition is to prevent BSIs in patients receiving hemodialysis and increase the use and visibility of CDC-recommended infection prevention practices. At a meeting of Coalition stakeholders held in September of 2016, attendees represented dialysis provider organizations, federal agencies, patients and patient advocates, professional societies, health departments, ESRD Networks, certification organizations, and others. Organizations shared their experiences with BSI prevention and education of staff and patients in dialysis centers. Attendees also discussed BSI prevention challenges and potential strategies to achieve success. By May of 2017, 50 organizations had joined the Coalition, demonstrating their dedication to this exciting initiative (7). In this article, we describe the Coalition in more detail, including its activities, aims, and benefits of joining. The basis for the Coalition is rooted in earlier work CDC conducted with multiple dialysis centers to prevent infections. In 2009, CDC began partnering with motivated staff members from individual hemodialysis centers to form the CDC Dialysis BSI Prevention Collaborative (“the Collaborative”) (8). The Collaborative was primarily a demonstration project to determine whether BSI rates in outpatient hemodialysis centers could be reduced through improved adherence to recommended infection prevention practices. The project was modeled after successful regional collaboratives to prevent CLABSIs in acute care settings (9,10). Facilities that joined the Collaborative volunteered to do so and were not a representative group (8). Participants worked with CDC to review evidence supporting various BSI prevention recommendations and determined the interventions that should be part of a hemodialysis-specific implementation bundle. These elements, later called the “Core Interventions for BSI Prevention” (Figure 1), were largely focused on evidence-based practices for hemodialysis CVC postinsertion care, use of standardized infection rate measures collected through the National Healthcare Safety Network (NHSN) for benchmarking, education and engagement of staff and patients around important infection prevention topics, performance of regular audits and competency assessments of staff to reinforce adherence to the interventions, and routine feedback of NHSN data and audit data to frontline staff (8,11). The interventions are described in greater detail below. At its peak, approximately 40 facilities were participating in the Collaborative, with varying levels of involvement. Centers for Disease Control and Prevention approach to bloodstream infection prevention in hemodialysis facilities. Adapted from https://www.cdc.gov/dialysis/prevention-tools/core-interventions.html). Several reports that emerged from the Collaborative have described its effect (8,12,13). A single Collaborative participant facility reported a reduction in access-related BSI rates from 2.04 per 100 patient-months preintervention to 0.75 per 100 patient-months after implementing Collaborative interventions, and a further reduction to 0.24 per 100 patient-months after adding a behavioral change intervention (12). An analysis of data from 17 participating centers that had consistent reporting and sufficient preintervention data demonstrated a rapid reduction in BSI and access-related BSI rates (32% and 54%, respectively) around the time of the Collaborative intervention implementation (8). The data in this report also demonstrated individual facility-level effects. In 2016, a follow-up study of the same 17 centers confirmed the initial reduction in access-related BSIs, and found that lowered rates were sustained in these centers for at least 4 years after the interventions were implemented (13). The greatest reductions in infection rate were observed among patients with CVCs and an estimated 286 access-related BSIs were prevented (among 46,351 patient-months) during the 48-month intervention period assessed. After the early success of the Collaborative was shown, CDC compiled the Core interventions used by Collaborative participants into a list for dissemination to all dialysis centers nationwide (11), along with the tools that had been created to assist centers with intervention implementation (14). This included checklists and audit tools that CDC and Collaborative participants had jointly developed (Supplemental Figure 1). The Collaborative was also the context for development of a protocol for performing hemodialysis catheter hub disinfection using a “scrub-the-hub” procedure (15). This procedure was intended to effectively disinfect the most likely point of intraluminal catheter contamination of hemodialysis CVCs. The CDC video, entitled “Preventing Bloodstream Infections in Outpatient Hemodialysis Patients: Best Practices for Dialysis Staff,” was additionally created to help educate staff using visual demonstrations of adherence to recommended practices during common procedures (16). The video contains five segments demonstrating hemodialysis center staff performing procedures and following infection prevention practices in a manner that aligns with the CDC checklists and audit tools. The segments focus on: hand hygiene and glove use, catheter exit site care, catheter connection and disconnection, arteriovenous fistula and graft cannulation and decannulation, and routine dialysis station disinfection. The target audience for most of the Collaborative tools and resources was frontline providers—i.e., dialysis nurses and patient care technicians. CDC continues to encourage all hemodialysis centers to adopt and follow the Core interventions (Figure 1) and regularly use CDC checklists, audit tools and protocols (https://www.cdc.gov/dialysis/prevention-tools/index.html), and educational resources (https://www.cdc.gov/dialysis/clinician/index.html) to prevent infections. In late 2015, Amgen, Inc. (Thousand Oaks, CA) provided funding to the CDC Foundation to support the Making Dialysis Safer for Patients Coalition. The Coalition is a 3-year project intended to build upon the successes of the Collaborative group and expand adoption of recommended practices to prevent BSI nationwide, through partnerships with a broad range of stakeholders in the dialysis and infection prevention communities. 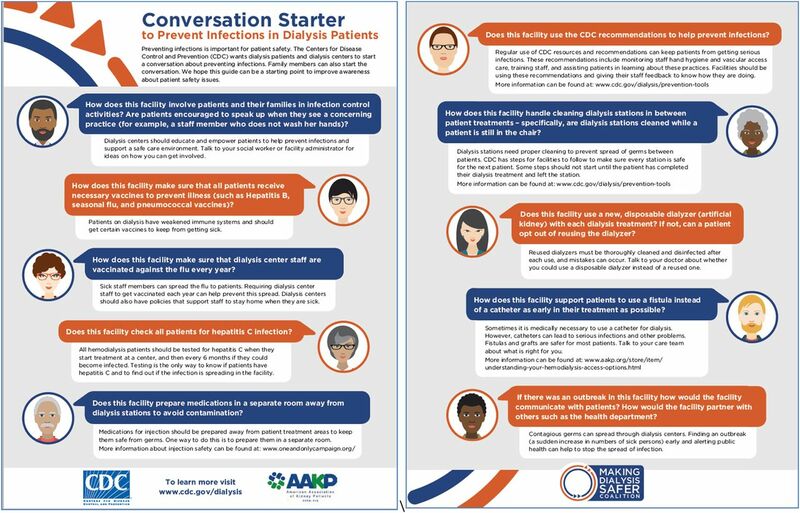 Patients and their representatives have a more central role in the Coalition effort, as evidenced by a “Conversation Starter” tool that was developed in collaboration with the American Association for Kidney Patients and released around the time of the Coalition launch (Figure 2). By joining and participating in the Coalition, facilities can access resources, education, and support that would help to achieve similar infection prevention results as the facilities that participated in the Collaborative. Conversation starter for patients, family members, and dialysis providers. The goals of the Making Dialysis Safer for Patients Coalition are to prevent BSIs among patients receiving hemodialysis, and increase utilization of CDC infection prevention recommendations, through awareness and increased uptake of CDC tools and recommended interventions, including those used during the Collaborative. This public-private partnership uses a three-tiered participation structure: Core, Partners, and Members (7). The Core group consists of individual dialysis infection prevention thought leaders, many of whom participated in the CDC Dialysis BSI Prevention Collaborative, and a patient representative. The role of the Core group members is to provide insights and feedback, including the patient perspective, for CDC Coalition leaders regarding activities and materials to facilitate implementation of CDC’s BSI prevention recommendations and interventions. The Coalition Partners include 50 committed organizations to date, including the American Society of Nephrology (ASN) and 13 dialysis provider organizations who collectively own and operate the majority of United States dialysis centers. The full list of Partner organizations can be found on the Coalition website (https://www.cdc.gov/dialysis/coalition/partners.html). Coalition Partner organizations fall into multiple categories: (1) professional organizations representing physicians, nurses, and/or technicians involved in dialysis care, or representing public health professionals, infection preventionists, or healthcare epidemiologists; (2) dialysis patient organizations; (3) dialysis and other healthcare delivery organizations; (4) federal agencies; (5) certification or accrediting organizations; (6) health departments; and (7) quality improvement organizations. Leadership from the Partner organizations provided commitment letters detailing their planned activities to advance the mission of the Coalition, such as promoting infection prevention educational opportunities, tools, and resources among their members, employees, patients, or constituents. The Coalition consists of >650 members. Members include individual dialysis facilities, or individual clinical care providers, patients, and patient advocates (not representing a larger organization). Members participate in the Coalition by serving as champions to promote the use of CDC infection prevention audit tools, checklists, and patient education materials within their facility. Nephrologists, including facility medical directors, and others are encouraged to join as Members of the Coalition by signing up through the website (6). Recent outreach to nephrologists conducted by ASN’s Nephrologists Transforming Dialysis Safety (NTDS) Initiative resulted in close to 100 nephrologists joining as Coalition members; nephrologists now comprise a sizable proportion of the Coalition membership. Key strategies employed in the Coalition include working through Partners and Members to increase awareness and facilitate implementation of CDC recommendations for BSI prevention, and facilitating sharing of experiences, successes, and challenges related to infection prevention. In 2017, the Coalition began hosting quarterly webinars on infection prevention topics with free continuing education (6). The Coalition also hosts bimonthly calls with Partners and dialysis provider organizations to share updates and highlight successful activities of individual organizations that others may wish to replicate. Communication and collaboration among the growing number of Partner organizations might help to address widespread challenges. Although the Coalition is not a research initiative, it serves as a venue for sharing information regarding new and promising interventions to reduce BSIs, including technologic advances. The Core interventions used in the Collaborative and promoted in the Coalition were developed through a review of evidence-based recommendations, and are intended to be implemented together as a bundle (Figure 1). This strategy of bundling together various approaches to CLABSI prevention in order to improve adherence to recommended practices is itself a CDC recommendation (17). Here, we summarize the interventions promoted through the Coalition. Catheter reduction (i.e., maximizing use of arteriovenous fistulas and grafts and minimizing use of CVCs) is clearly the optimal way to reduce each individual patient’s risk for BSI (2,18). Catheter use in prevalent patients has decreased in the past decade to 18% in 2014; however, catheter use among patients initiating hemodialysis remains high, at 80% (1). Effectively lowering this figure may be extremely challenging to achieve and requires engagement of predialysis care systems, but would have beneficial effect on the occurrence of BSIs in this patient population (18,19). As part of routine infection prevention efforts, providers should continue to work to avoid catheters to the extent possible, address barriers to catheter removal, and reduce the amount of time that catheters are in place. As the Coalition expands, there may be greater opportunities to interface with care systems and provider groups whose commitment and coordination are needed to improve vascular access planning for incident and prevalent patients receiving hemodialysis. Specific catheter maintenance care practices included in the Coalition intervention list are: use of chlorhexidine for CVC exit site skin antisepsis, routine performance of catheter hub disinfection, and use of antimicrobial ointment at the CVC exit site (Figure 1). CDC recommends chlorhexidine (>0.5%) with alcohol be applied to the CVC insertion site during catheter insertion and catheter dressing changes. The recommendation is based on evidence demonstrating the superiority of chlorhexidine over other antiseptic solutions (17,20,21). Chlorhexidine with alcohol for catheter insertion site antisepsis has also been included in most central line insertion and postinsertion care bundles that resulted in reductions in CLABSI rates in inpatient populations. Catheter hub disinfection is an important intervention that might have contributed to additional, substantial reductions in access-related BSI rates in the Dialysis Collaborative (13). CDC recommends scrubbing catheter access ports with an appropriate antiseptic (i.e., chlorhexidine with alcohol, povidone iodine, an iodophor, or 70% alcohol) before accessing (17). When applied to hemodialysis catheters, the intervention includes performing an antiseptic-scrub of catheter hubs with the caps removed, every time the catheter is accessed or disconnected (Figure 1). A protocol developed through the Collaborative provides step-by-step instructions for performing the procedure (15). Before the introduction of this hub-scrub procedure, many facilities were soaking catheter caps in antiseptic solution without performing any disinfection procedure on the actual catheter connection site underneath the caps, and some were using an antiseptic or disinfectant with limited evidence to support its effectiveness at reducing infections. In a large, cluster-randomized controlled trial, investigators showed that implementing two CDC-recommended catheter care procedures (routine use of chlorhexidine with alcohol for exit site care, and alcohol pads for performing hub-scrub procedures upon accessing and disconnection) resulted in a 21% reduction in BSI rate among patients with catheters at 3 months, and 41% reduction at 1 year, after intervention implementation (22). Significant reductions in secondary outcomes, such as hospitalizations for sepsis and intravenous antibiotic starts, were also identified in the study. This trial provided high quality evidence from typical dialysis centers that confirmed the effectiveness of these two elements of the Coalition intervention list. For hemodialysis catheters, CDC recommends use of antimicrobial ointment at the catheter exit site after catheter insertion and at each dialysis treatment session, when there is no contraindication resulting from an interaction between the catheter material and the ointment (17). Specifically recommended are povidone-iodine ointment or bacitracin/gramicidin/polymyxin B (Polysporin Triple antibiotic) ointment, which are supported by strong evidence demonstrating their effectiveness. For example, a randomized placebo-controlled trial found that use of bacitracin/gramicidin/polymyxin B ointment significantly reduced catheter-related infections and bacteremias, and was associated with a survival benefit (23). Unfortunately, Polysporin Triple ointment is not available in the United States and povidone-iodine ointment contains polyethylene glycol, which is incompatible with some hemodialysis catheter materials. For these reasons, the Coalition interventions describe bacitracin/neomycin/polymyxin B as an ointment that could be used and might have similar benefit to Polysporin Triple (11). Although the evidence supporting use of chlorhexidine-impregnated dressings in long-term hemodialysis catheters is limited, such dressings are also described as a potential alternative to antimicrobial ointment that would avoid catheter-compatibility issues. Performance of catheter care audits (both exit site care and catheter connections and disconnections), with feedback of results to staff, is a recommended means of assuring and reinforcing adherence to guidelines (17). CDC audit tools exist to facilitate performance of these audits at the suggested frequency of quarterly (11,14). Although emerging evidence suggests that buttonhole cannulation of fistulas is associated with greater risk of access-related BSIs compared with traditional rope-ladder cannulation (24–26), fistulas otherwise confer low risk of infection. Both arteriovenous fistulas and grafts are associated with much lower rates of BSI and local access site infection, when compared with CVCs. As a result, there is little data to demonstrate the ability to affect BSI rates through interventions purely focused on improved fistula or graft care. In the CDC Collaborative sustainability study, there was no significant reduction in access-related BSI rates among the fistula or graft strata (13). Despite this, observations of fistula and graft cannulation, with feedback of results to staff, continue to be part of the Coalition intervention package. Areas for improvement of general infection control practices that are pertinent to fistulas and grafts and reflected on CDC audit tools include proper application of an appropriate skin antiseptic (e.g., applying sufficient antiseptic and achieving necessary contact time) and adherence to aseptic technique. Staff education and competency assessments are essential to the implementation of interventions that require provider behavior change. CDC recommends education of staff regarding proper procedures for catheter maintenance and appropriate measures to prevent catheter-related infections, as well as training and education on general infection control measures (17,27). Further, personnel should demonstrate competence in catheter maintenance before being assigned to perform catheter care (17). The Coalition encourages staff education and training on a variety of infection control topics, including vascular access care and aseptic technique, and tailoring of the education to the staff member’s job responsibilities. Competency evaluations for skills such as catheter care should be performed upon hire and every 6–12 months (Figure 1). Hand hygiene is a general measure, not specific to BSI reduction efforts, but is considered the cornerstone of infection prevention and has been included in CLABSI prevention recommendations and implementation bundles (17). A large number of hand hygiene opportunities (i.e., moments when performance of hand hygiene is warranted) occur during delivery of hemodialysis. The available literature suggests substantial need for improvement of hand hygiene adherence in dialysis centers (28–31). CDC suggests performing observations of hand hygiene opportunities every month (11). A hand hygiene audit tool is available to guide the collection of observation information and provides descriptions of hand hygiene opportunities that are specific to hemodialysis settings (14). Hand hygiene is also an important element included in all other CDC audit tools. Observers are encouraged to include in their observations hand hygiene opportunities that are likely to be high-impact (e.g., before an aseptic procedure, between direct contacts with one patient and then another) and perform observations across a variety of staff, shifts, and days of the week. Importantly, facilities should share audit results with frontline clinical staff so they have a direct appreciation of their performance and areas that warrant improvement. These principles apply to all suggested infection control audits in hemodialysis. Tracking infection data and sharing it with frontline staff is an important element of the intervention package (Figure 1). CDC recommends performing surveillance for BSIs and other adverse events (27). Currently, >6000 outpatient dialysis centers report BSI and related event data to the NHSN (2). NHSN allows users to immediately view and analyze their own data, making it an attractive system for both monitoring and prevention. Facilities can run reports that allow them to compare rates to national aggregate data, and can export their data for analysis outside the application. A study in a British hemodialysis unit found that access-related BSI rates were reduced purely by instituting standardized surveillance and sharing the infection rate data with clinical staff (32). These activities led to increased awareness among all clinical staff of the problem of infections and stimulated unit-led quality improvement efforts. Data on the local occurrence of BSIs can be shared with facility staff and patients in a variety of ways. 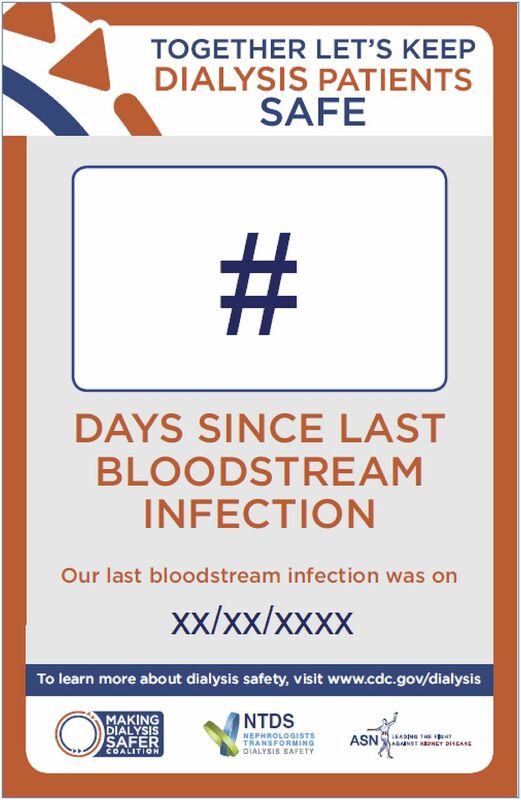 CDC and ASN’s NTDS recently collaborated to develop a poster that can be used to display the number of days elapsed since the last BSI occurred in a patient treated at the facility (Figure 3). Once finalized, the posters will be available to print or order from CDC and their use will be promoted through the Coalition. Poster for dialysis centers to communicate time since last infection. In addition to infection rate data reported to the Dialysis Event Surveillance (a module that is required under the Centers for Medicare and Medicaid Services ESRD Quality Incentive Program), NHSN also houses several optional reporting modules, including the “Prevention Process Measures” module. This feature allows facilities to track results of infection control observations performed, and document issues identified (33). The module is a resource that can be used for any of the CDC audit tools (e.g., observations of catheter connections and disconnections and injectable medication preparation and administration) and these results can be assessed in the context of facility infection rate data in NHSN. Data on the benefits of patient education and engagement on the topic of infection prevention are sparse. Yet, it stands to reason that these individuals who spend much of their time receiving healthcare can contribute to positive outcomes in their own care and for other patients in their facility. Limited studies or evaluations incorporating patient opinions have demonstrated that patients view infections as important adverse events and many wish to become involved to help ensure the safety and quality of care they receive (34,35). Although CDC suggests some topic areas for patient education (vascular access care, hand hygiene, risks related to catheter use, recognizing signs of infection, and instructions for access management when away from the dialysis unit), the best means of engaging patients in clinic infection prevention activities is unknown. Dialysis center staff are encouraged to begin having discussions with patients and their family members about infection control as a first step (Figure 2). The Coalition aims to identify other patient engagement approaches that have been trialed (36) and for which there is evidence for efficacy, facilitate sharing of experiences around these, and work with patient-focused organizations to determine the best ways of engaging patients in infection prevention efforts. CDC’s Collaborative and Coalition are not alone in utilizing strategies such as networking and information-sharing to improve care practices (37,38). The Standardizing Care to Improve Outcomes in Pediatric ESRD (SCOPE) Collaborative includes projects to prevent peritoneal dialysis– and hemodialysis-related infections in pediatric patients (38). The SCOPE Collaborative approach to infection prevention mirrors that of the Coalition and includes standardization of care procedures; audits to reinforce adherence; education of staff, patients, and families; and transparent data-sharing and networking across facilities. Through partnerships, communication, education, and collaboration, we hope to learn from and expand upon such initiatives. Thus far, successful aspects of the Coalition include well attended educational webinars, increased attention to patient perspectives, and meaningful participation and commitment from representatives of a large number of Partner organizations. However, there are recognized challenges ahead. The approach to implementing and reinforcing adherence to infection prevention practices in a single independent dialysis center is likely to be markedly different from strategies used by a large dialysis organization to reach staff members in hundreds or thousands of dialysis centers and influence their daily practice. Regardless of facility ownership type, achieving consistent adherence to recommended practice requires much more than modifications to facility policy and occasional training of staff. ASN, the Renal Physicians Association, and others have acknowledged that dramatic shifts in the safety culture within most dialysis facilities and within the mindsets of facility leadership will be needed to achieve our shared goals. The Coalition path forward is still being forged, and we expect it to be shaped by the interests, needs, and priorities of Partners and Members. In the near future, the Coalition plans to assist and support Partner organizations to maximize their unique contributions to infection prevention. For example, the Coalition is working with ASN, through NTDS, to share guidelines and actionable infection prevention information with nephrologists and leverage their role as essential patient safety leaders and decision-makers to advance infection prevention (39). We are engaging nephrology nurses to become trained in infection prevention and serve as local leaders who can build elements of an infection prevention program within their facilities and help to train others. Dialysis provider organizations are energized and asked to consider additional tools, resources, and strategies that would enable them to educate their staff and achieve widespread adoption of the Core interventions. To facilitate communication and sharing across all Partners, the Coalition is hosting a second Partner meeting in September 2017. The meeting will help to maintain the momentum of the Coalition and active participation by Partners, and will serve as a forum to discuss future plans. Through synergies with a broad network of committed Partners, we believe creative solutions can be identified and barriers can be addressed to successfully prevent BSIs and make dialysis safer for patients. The authors wish to acknowledge Abbigail Tumpey, Nicole Gualandi, and Ibironke Apata for their many contributions to the success of the Making Dialysis Safer for Patients Coalition. The findings and conclusions in this report are those of the authors and do not necessarily represent the official position of the Centers for Disease Control and Prevention (CDC). Use of trade names, commercial sources, or private organizations is for identification only and does not imply endorsement by the US Department of Health and Human Services or CDC. This article contains supplemental material online at http://cjasn.asnjournals.org/lookup/suppl/doi:10.2215/CJN.02730317/-/DCSupplemental.